Here’s your weekend list! As you’d guess there are lots of egg hunts and Easter events this weekend. But we also found Earth Day celebrations, free movies, fun library events, and much more! We’ve included some egg hunts on this list, but to see ALL of them just go here to our master guide! Bunny Patch at Thomasson Family Farm Enumclaw 9am-2pm. Ongoing egg hunt, playground activities, tractor train rides, Easter bunny, face painting, farm animals and crafts (while supplies last)!!! This is a ticketed event. See link for details. There is a discount for advance, online purchase. Readers have liked this one a lot, especially for younger children. Sponsored by Faith and Victory Church. FVC Community Egg Hunt. Egg hunt, Free hotdog lunch, face painting and door prizes! Egg hunt starts at 12pm sharp! Join Us in Celebrating WORLD CIRCUS DAY! FREE Classes for children ages 2 to 16 years starting every 15 minutes from 1pm-3pm. We will be doing aerial, tumbling, tightwire, and juggling! We have linked to some egg hunts in this post, but there are many more on our master list. Hunts at different times for children 0-10, plus face painting, crafts, pics with the bunny, and other fun. Be sure to check the link for the times and don’t be late. A fun, spring themed carnival and egg hunt! The Spring Eggstravaganza will be held Saturday, April 20th at the Puyallup Recreation Center from 10am-12pm. This event features three egg hunts for specific age groups and carnival games! Get your candy, prizes, and pictures with the Bunny! Note from SFM: I believe some of the activities are cash only, so keep that in mind. starts at 10 a.m. at Edgemont Park, located adjacent to Edgemont Junior High School at 24th Street East and 110th Avenue East. Tacoma-Pierce County Health Department is hosting a special event for new mothers-to-be on Saturday morning on April 20, 2019! There will be food, games, door prizes and giveaways. Sea Mar staff will also be present to answer any questions about Sea Mar programs and services. petting zoo and egg hunt! 10AM Advance registration is now required for these popular, free nature walks Not suitable for strollers; perfect for ages 3 and up. Celebrate the arrival of spring at this free community festival. Enjoy a variety of themed arts and crafts, games, and family activities. 10am-12 Bring swimsuits and hop in the pool for a free open swim from 11 am-12 pm! 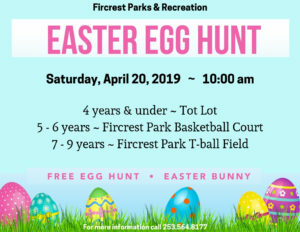 The Fircrest Annual Easter Egg Hunt happens on Saturday, April 20 at 10 am. Join Luna and her magic flute as she embarks on a magical adventure with friends pony, dolphin, hummingbird – and dragon! Best for children ages 5-10 and their families. Visit the LOTT Wet Science Center and celebrate Earth Day. Over 20,000 colorful eggs are nestled in the large grassy area behind the stadium at Tumwater High School, just waiting to be discovered. Free event for ages 0-10. 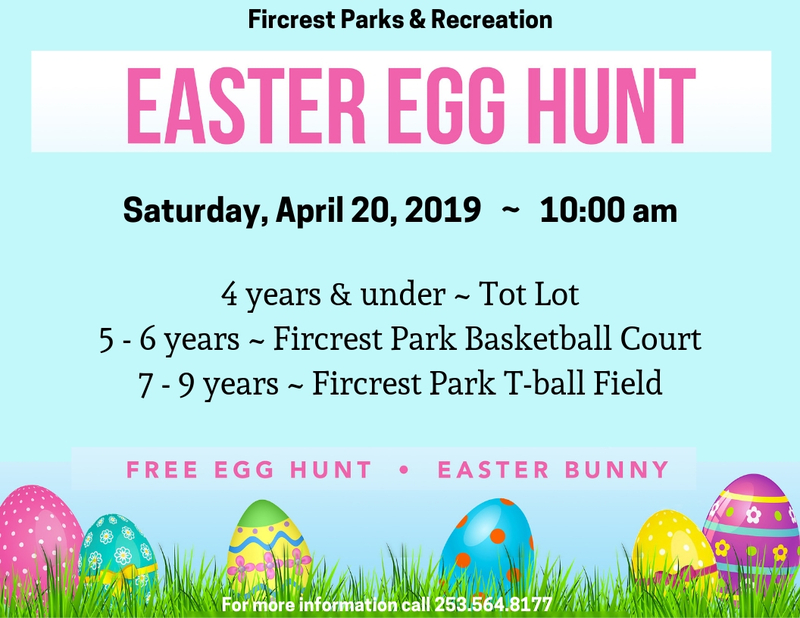 This FREE event takes place at the Regional Athletic Complex (RAC) in Lacey and offers kids 2-10 the opportunity to “dash” for candy and prizes hidden in over 18,000 plastic eggs. Children ages 2-3 and any children needing special assistance will begin promptly at 11 A.M., with 4-5 year olds, 6-7 year olds, and 8-10 year olds following in close succession. Parents: to avoid a disappointed child, plan on arriving early to find parking. Hop on over to AR Workshop for some Spring and Easter Crafternoon fun with the family! Make a Canvas Easter Egg Tote or our specialty Mini Wood Signs! (One registrant can make 1 mini wood sign for $15, or 2 for $25). (Totally kid friendly! Perfect for ages 7 and up. Younger children can do this with mom and dad’s close help) REGISTRATION REQUIRED to guarantee your spot and allow us time to prepare your design! Traditionally, there is a hunt hosted by the Boy Scouts on the Key Peninsula Civic Center grounds at noon on Saturday. Meet Mik and the Beanstalk. Mik is a Certified Arborist happy to share his knowledge of the trees of Point Defiance with you; and the Beanstalk is a 186-foot Pseudotsuga menziesii, a.k.a. Douglas-fir, located a stone’s throw away from Fort Nisqually. Less than 500′ of walking required. As always, if you need a hand, or know something fun we should add, get in touch! We also super appreciate when you mention Sounds Fun Mom to your favorite local businesses and groups. We exist because of awesome sponsors and readers! Need something fun to do with the kids today? How about bunny photos, Charlie Brown, or checking out the aquarium? As always, I appreciate you using the provided links to confirm event details before you head out! Thanks for doing that! Celebrate National Poetry Month with Tahoma Audubon Society, Tacoma Public Library and Pierce County Library at Tacoma Nature Center. Read aloud a nature-themed poem from a published author or your own work, and listen to others share their poems. Following the readings we will walk the Tahoma Audubon poetry walk installation located at Tacoma Nature Center. I have been spending much of this week at the hospital with my mom (She’s on the mend!) There will be a weekend list, but it will likely be late. Barnes and Noble story time Most area stores offer a story time for children at 11am. We do suggest confirming with yours as we have found participation to be inconsistent. It’s We Are the Gardeners at most stores today. Choose from two different classes for kids every Saturday. 2.00 or 5.00 per child, depending on class. “Egg-stra fun,” crafts are the theme today. Note: Select, “Kids’ Club,” and then find your store by location. Just Between Friends consignment event at the fairgrounds in Puyallup Biggest JBF event west of the Mississippi! Score a bargain on kids gear and duds. Full STEAM Ahead – Spring at the Orting Library 2:30pm – 3:30pm Learn about the season of spring through science, technology, engineering, art and math activities. All ages; under 6 with an adult. The Cherry Blossom Festival is a longstanding Kent School District tradition that celebrates the region’s connection to Japanese and Asian cultures and provides an opportunity to meet Japanese exchange students currently visiting the high schools. The festival celebrates Japanese culture and will feature many activities, including martial art demonstrations, children’s activities, food, and more! Ticket sales will benefit Kent high schools’ Associated Student Body (ASB) programs: $5 in advance $7 at the door. Children under 12 years old are free with a paid adult admission. Barnes and Noble story time Most area stores offer a story time for children at 11am. We do suggest confirming with yours as we have found participation to be inconsistent. It’s Little Blue Truck’s Springtime at most stores today. Choose from two different classes for kids every Saturday. 2.00 or 5.00 per child, depending on class. Gnome themed crafts today. Note: Select, “Kids’ Club,” and then find your store by location. Auburn Avenue Kids presents You’re A Good Man, Charlie Brown 2PM; tickets are 10.00. Annual event for children with special needs and their families. There will be pony rides, a petting zoo, face painting, games to play and a free lunch. Note from SFM: I don’t see any registration requirements, but you may want to check on this before you head out. Huge toy show with over 100 vendors with toys, action figures, Lego, comic books, and more. The Toy Show will open at 9 am for Early Bird ticket holders and then at 10 am for all General Admission entry. General Admission Tickets are only $5 ($10 for Early Bird Tickets) and kids 12 and under are free with an adult. All tickets are purchased at the door before the show. Explore Your World – Squishy Circuits at the Bonney Lake Library 2pm Explore STEM at your library! Create working circuits using electricity-conducting Play-Doh. Lights, sounds and motors bring electric learning to life! Celebrating it’s 51st year, the Fieldhouse Flea Market is the University of Puget Sound Women’s League’s annual one-day fundraiser. This popular community event has been held since 1968 and has raised over a million dollars for student scholarships. Tickets are available on the day of the event at the door. $5 to enter at 10 a.m.; $15 to gain early access at 8:00. You’ll get a hand-stamp that allows you to come and go all day! Best part? Your admission price goes directly to student scholarships! Note from SFM:O.K….not a kids’ event, but I mean to go to this every year, so I thought I’d mention it in case you do, too! See a show at the Pierce College Science Dome The area’s only indoor planetarium. It’s great! This interactive planetarium show is specially designed for visitors aged 3-12. Why is the Moon bright? Why do we have shadows? Are there types of light we can’t see? Come solve these mysteries! Approximately 45 minutes. $6 for participating children. Adults get in free! You only need to reserve seats for children. Explore Your World: Chemistry at the Key Center Library 2-3pm Explore basic principles of chemical experimentation. Ribbon Cutting For Ancich Waterfront Park 12pm Location: Ancich Waterfront Park, 3557 Harborview Drive, Gig Harbor 98335 Note from SFM: I’ll let you decide if this would be of interest to your kids. Do let me know if the park is a place you’d recommend! Natural birth and parenting expo Note from SFM: While not a kids’ event, I thought this might be of interest. Let me know how it is if you go. Visit the LOTT Wet Science Center and learn how to rise above plastics today. Our lives are full of plastic products and now our oceans are full of plastics too. Microplastics get mistaken for food by marine animals, and it’s estimated that by 2050 there may be more plastics in the ocean than fish. Join the Surfrider Foundation for a 2 pm presentation and learn fascinating facts about plastic, how it impacts our environment, and how you can make simple changes in your daily life to combat the plastic pollution problem. Related crafts and activities all day. Community Baby Shower: For new and expecting parents and their families at the Lacey Timberland Library 10am Community organizations and library staff will provide free information for new parents and answer questions on topics like health, early literacy, and parenting resources. Refreshments and giveaways. Note from SFM: While not a kids’ event exactly, I thought this might be of interest. Special concerts just for kids at UPS. A perfect way to introduce children to classical music and instrumentation. Readers have loved these! Today is Around the World in 80 Drums! Ever wanted to learn about gold prospecting? Here’s your chance. Kids 12 and under are free, and readers in the past have said they had fun trying gold panning. Adults are 5.00 in advance/10.00 at the door; military and veterans with ID are free. Less than 500′ of walking required. To Register: SIGN UP ONLINE or call (253) 305-1022 4.00/person Note from SFM: I see two different times listed; double check when you register. Bring donations to help the Humane Society get ready for kitten season, plus enjoy some light refreshments, have fun with a kid-friendly craft activity, and learn about becoming a kitten foster parent. This is a free community event, open to any single (feeling) mamas in the region, regardless of actual marital status, age, etc. Wearing a work dress of the era, Karen Haas portrays four very different women of the summer of 1855 as she sings their songs and tells their stories. Barnes and Noble story time Most area stores offer a story time for children at 11am. We do suggest confirming with yours as we have found participation to be inconsistent. It’s How to Catch a Leprechaun at most stores today. Choose from two different classes for kids every Saturday. 2.00 or 5.00 per child, depending on class. Rainbow themed craft today. Note: Select, “Kids’ Club,” and then find your store by location. Runs the 14th-17th. Grab a bargain on kids’ gear and duds! Featured: Choose from Two great previews of the Pinocchio Ballet! Photo op alert! Family program, all ages welcome. Ages 6 and younger with adult. Cirque Éloize Saloon at the Pantages Theater. Dads, uncles, grandfathers, big brothers, moms, grandmas and even aunts are welcome to accompany their little princess to the annual sweetheart dance. Register in person at the Curtis Student Accounts Office with cash or check ONLY or online by clicking. Note from SFM: I am not sure if the online registration is still open. While not specifically a kids’ event, this unique, evening makers market is open to all ages, and we’ve heard it’s a lot of fun. Friends of the Lakewood Library Book Sale 10:00am – 4:30pm Membership not required. Proceeds support Lakewood Library events, classes and services. Bring your own bag! A bit out of our usual, “Territory,” here at SFM, but this is the closest big St.Patrick’s Day event to the South Sound. Been? Got parade tips? Leave a comment! Yoga Story Time at the Gig Harbor Library 10:30 Yoga movements, books and songs for preschoolers! You do need to register for this one. Read to a Dog at the DuPont Library 1:00pm – 2:00pm Share a book with a furry friend while improving your reading skills. Visit the LOTT Wet Science Center and learn about robotics today. Experience the amazing world of robots! From 11 am to 4 pm, local robotics students lead hands-on activities for all ages. Sign up for “Robot Garage” workshops offered by the Museum of Flight at 11 am and 2 pm. These free workshops are for 4th grade and up, with no experience required. Participants use robotics kits to explore basic engineering skills, learn robotics history, and discuss cutting edge robots in space. Registration is required for the workshops. Register at https://robotgarage.eventbrite.com. Black Diamond Camp Community Adventure Day Free community events; try out camp! Be sure to sign the waiver in advance and read other event details at the link. Just Between Friends Sale in Federal Way Runs the 14th-17th. Grab a bargain on kids’ gear and duds! Reading with Rover at the Covington Library. Block Party! LEGO® at the Library in Federal Way. 2-4pm Family program, all ages welcome. Watch animals enjoy special themed treats and enrichments. Included with admission. Flaming Geyser State Park, located on the Green River near Black Diamond, has over 500 acres of land, including three miles of shoreline along the Green River. This popular day-use park also offers picnic tables, fishing, swimming, trails and even an area for flying model airplanes. A popular natural feature of the area is a bubbling geyser and a flaming geyser. Unfortunately, the underground methane is depleted and the flame usually isn’t lit anymore but the bubbling geyser still bubbles. This easy hike is a fun, beautiful way to see the different features of the park. Go in the main entrance of the park at 23700 S.E. Flaming Geyser Road Auburn, WA 98092. You do need a Discover Pass to park, there is a station where you can buy a day pass at the entrance. Once you drive in, you will see parking on your left and a sign with “Flaming Geyser” and an arrow pointing right. Turn right and follow the road all the way to the end. Park in the lot (don’t forget to display your Discover Pass) and the trail starts at the far end of the parking lot. At the trail head, you’ll see a white gate and an informational pavilion. The trail starts out as a wide, gravel path. Pass the Steelhead Conditioning pond. The kids might want to check it out, I didn’t see any fish when I was there. Next you can check out the area that has the Flaming Geyser. We didn’t see any flame, but I’ve heard that there is sometimes a tiny one burning. The flaming and bubbling geysers were both created when coal miners drilling for coal hit pockets of methane. Back then, it is said that the flame shot up 25 feet! Continue down the path and see the sign for Bubbling Geyser. For the bubbling geyser, there is a series of wooden steps to get to the viewing platform. It’s a bit steep– but this will be the only climb in this hike. Once you get to the platform, which is built over Christie’s creek, you will have to watch the water for a few minutes and have some patience, but you will see bubbles coming up. The forest on the way is also beautiful, lots of interesting trees and hanging moss. up and then down to a viewing platform. By the platform is a pretty little waterfall. The water has a gray sediment. You can read about this on the plaque on the platform. Once you descend the steps and get back to the main trail, turn right to keep going. The trail narrows and winds through the forest. You will see some peek-a-boo views of the river along the way. There are several turn offs to get to the river, we turned left at a path that was marked by some big rocks and went down to the riverbank. After you’ve enjoyed the river view, just make a U-turn and head back the way you came for a 2.5 mile hike. Once you get back to the bubbling and flaming geyser signs, cross the bridge and hang a right to walk along a paved path by the river with some interpretive signs about the salmon and steelhead trout. Once you are done, there is lots of open, grassy area for playing, picnic tables, a kid’s play set for climbing and real bathrooms! A quick reminder that tomorrow, Tuesday, March 12th, is free pancake day at IHOP. If you’ve been wondering when this year’s free pancake day is, here’s the scoop straight from their fb event page! Get excited! We’re celebrating with FREE short stacks of Buttermilk Pancakes on March 12, 2019, from 7 am to 7 pm, with select locations until 10 pm. Join us to get your free stack and donate to help children battling critical illnesses. Just as our new name says, each stack served on IHOP Free Pancake Day helps us flip it forward for kids. It’s not a bad idea to call ahead to confirm your location is participating, and yes, you should plan on a crowd.